These Mud Hen Bars are a Gooey Chocolate Chip Marshmallow bar topped with Brown Sugar Meringue! So good!! Sometimes names can be deceiving. Haven’t you ever met a person and been like, yeah…your parents SO should have named you Jan and not Heather? Or Brody and not Chuck? It happens. Same thing happened with these bars. They’re called Mud Hen Bars. Which is basically the grossest name ever. Mud is not tasty…Hens are all pecky and whatnot… And the google told me a “Mud Hen” is a gross marsh bird that lives in swamps and other wetland-type areas. Well, I am not a bird-fan in general. They scare me. I mean, they can fly. Think about it. AND Mud Hens are not only birds, they live in swamps. Swamp birds. Could there be a worse type? But defying all laws of logic I made these Mud Hen Bars. They sound gross. But they aren’t. They’re exactly the opposite. This Mud Hen Bars recipe is really easy. What is a Mud Hen Bar? 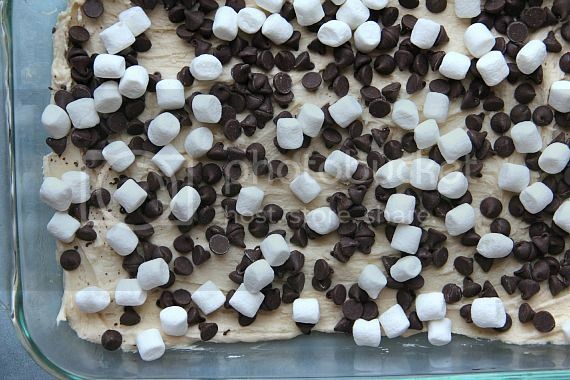 The best way to describe Mud Hen Bars is they are is a kind-of cookie base, topped with chocolate chips and marshmallows with a yummy brown sugar meringue spread all over the top. What you’ll get is a gooey cookie bar topped with a light, crunchy meringue topping. Such a cool combination of textures. They might not be pretty, but they are tasty. This Mud Hen Bar recipe was originally published on my site in 2012. I have since updated some of the pictures and slightly tweaked the recipe. Enjoy! Chewy Chocolate Chip Cookie bars topped with a crunch brown sugar meringue! In a large bowl cream together butter, granulated sugar, 1 whole egg plus 2 yolks and vanilla until smooth. Add in flour, baking powder and salt and mix until just combined. Spread in prepared pan. Top with chocolate chips and mini marshmallows. In a clean mixing bowl with whisk attachment on your mixer, beat the 2 remaining egg whites until stiff peaks form, about 2 minutes on high. Fold in light brown sugar and stir until combined and there are no lumps. 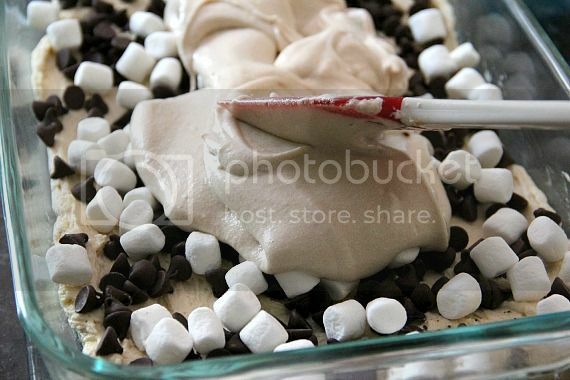 Spread on top of chocolate chips and marshmallows. Bake 30-35 minutes until top is golden brown. I’m am trying these today! Deborah/tasteandtell made these last year and they made her Best Of list for 2011 (how I remember this, I don’t know – I love desserts…lol) But now that I see you make them, I want to make them even more. They have all the layers and elements that I just love! Yum! I’ve never heard of a mud hen before but these bars look delish! Can’t wait to make these. Thanks for sharing the recipe! I love the top of these bars! Whoa. That’s the tastiest dirty pecking hen I’ve ever seen. Durn. Can you believe I have never tried these? Probably because they are named after a filthy bird. Those bars definitly look MUCH BETTER than the name implies. I’ve never heard of a mudhen bar, but I will have to give them a try! I totally made these last year and fell in love with them. Now I need to make more!! I don’t care what you call them, just send me a few dozen and I’ll be happy as can be. Love these! These look really really tasty!!!! I would make them. Then rename them. These things should be illegal they are so good! I have never heard that name before but I LOVE it!! Girl, these look amazing! I’ve been wanting to make mud hen bars forever but always forget, thanks for a delicious reminder! I don’t care what they’re called – they look incredible! I’m totally scared of birds too. I had a roommate with a large parrot and basically lived in fear for 1 entire year. How gooey these look! Ok, is it too early for these? No? Ok…. give me the plate please! Love these Shelly! I always look forward to your posts! I’ve never heard of these before! But I need them in my life. Anything with meringue, I am there. Shelly—Have you seen the Pumkin Spice cream cheese they have out now? Aldi has it but Philly Brand has it out in the regular grocery stores I see. It taste like pumkin cheesecake straight from the container! I had a hard time not just sitting down with a spoon and polishing it all off!! But I keep thinking it would be great in a fall dessert…but what?? Have you seen it/tried it? Any ideas?? Yes. Run. Go find it. Buy two. One to eat with a spoon. One to make something out of. It’s really great on a toasted cinnamon crumpet too. Sheely, you are too funny! The name doesn’t bother me at all, and I simply can’t get over that crispy top!! I’ve heard of these before, but have not made them. Your photos and description definitely make me want to change that, though! That meringue on top looks like a great texture contrast. Yum! I’ve wondered about that name. But they sure look tasty! Whoa – these look stunning! I don’t care WHAT they are called! Wow! I could eat the whole pan! You are so right…weird name, but they look delicious! They look fabulous!!! Swamp birds. Yikes. With a name so memorable like that, how could you ever rename it? 🙂 Omgosh, thanks for the tip on the pumpkin cream cheese! Philadelphia cream cheese has milk chocolate and dark chocolate Indulgence brand of soft chocolate cream cheese that is incredible. The dark chocolate is my favorite! They sell it in little gold tubs. I can’t wait to see some recipes with this fabulous, creamy deliciousness! I have never heard of these before! But this post cracked me up! They look delicious. Brown sugar meringue?! Oh my this sounds incredible! I have never heard of these before, but now I want them! These actually look amazing, despite the name. I think the coolest thing is just digging through old recipe boxes, particularly family recipe boxes! My mom is set to inherit my grandfather’s old recipe box, which is filled with tons of recipes passed down from his family, as well. I think on my next visit to see him, I’ll have to dig through and see what treasures I find! I am totally he same way about birds! They terrify me. Those look soooo yummy though. Will definitely be trying them! These look yummers!!! My son would love them, but he’s away at school, do these have to be refrigerated? Would love to send him some! Thanks for the recipe..btw new to your blog & I love it! Mudhens is the name of the minor league baseball team in Toledo, Ohio. I know a lot of my friends and family would love to eat these! My kids were off school today so I made these bars for them. Very good and they were a hit with all of us. Thank you for the yummy, new recipe!! Loved the topping. Wow! Do you ever stop coming up with great ideas? Yum! That’s so funny! Such an awful name for such a delicious dessert. They look fantastic! i think i would eat the whole tray! I will gladly make these under the condition that we all agree to not call them Mud Hens. It’s just plain odd but that meringue may be worth it. They might be messy looking, but they sound to die for!! I just took these out of the oven – can’t wait to dig in! How interesting!! I think i would like the texture! 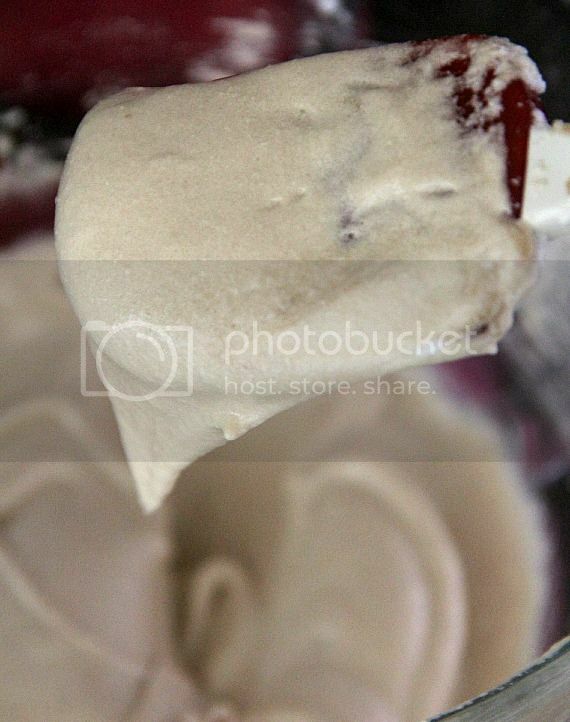 Oh that brown sugar meringue sounds pretty amazing! I made these this morning and they were awesome! I decided to make these amazing looking bars yesterday, but didn’t have any chocolate chips in the house. GASP! So used butterscotch chips instead. I think my husband fell a little more in love with me last night. He LOVES butterscotch and LOVED these bars. I think I’m going to have to make them again with chocolate chips just to compare though. I’ve never heard of these before but they sound amazing! My mama made these for her bridge club when I was growing up and I had forgotten all about them and how good they are! Now I HAVE to make them . . . tonight! Ok, this is a matter of aging myself, but, here goes….in times gone by…..people would refer to someone as ‘uglier than a *mud-hen*’, when they were not particularly enamored with that persons’ looks or manner. You may have heard ‘mud-fence’ also. Same difference. It means they are not especially attractive, or down-right ugly!! Someone in the comments said they (the bars), didn’t look good, but taste wonderful. There you go!!! Mystery solved. Thanks for the recipe, tho, I had forgotten about these delights!!! The Mudhens are a Toledo, Ohio local baseball team. They are a “farm” team, a minor league team for the Detroit Tigers. Maxwell Klinger of M*A*S*H fame often wore Mudhens uniform stuff on the show. He was from Toledo Ohio and got his stuff from the team. I guess that was all before y’all’s time! A mudhen is an Ohio native bird. Lots of the midwest is marshy and so of course there are many kinds of water birds, not just ducks. They are not chickens though, technically considered a “rail”, although to new settlers they must have looked from afar like chickens living on the water’s edge. They are black with white on the head and beak, and they can swim although they don’t have webbed feet like a duck, but rather thick toes. Actually they are very handsome birds. Water and marsh are not the same as swamp! My guess is these bars must be some local Toledo or Ohio treat. Probably find it somewhere on Google…. My mom used to make these when I was a kid, only she also put walnuts in hers. I usually make them without the walnuts, due to picky kids. However, if I do make them with nuts again, I’ll probably put pecans in them because I love pecans…or maybe almonds or cashews. Where I live, it is hard to find marshmallows. Do you think, or has anyone tried substituting a jar of marshmallow cream? I think if you did add marshmallow creme, you would only want to make it a thin layer. If you try it let me know! Have you ever tried to make your own marshmallows?! The taste is phenomenal and worth the effort especially if they aren’t readily available. Here’s a recipe from Alton Brown http://www.foodnetwork.com/recipes/alton-brown/homemade-marshmallows-recipe/index.html. Yes! I have, and homemade marshmallows are SO way better than store bought! I did try this and it was delicious. The bottom layer was a little gooey. I’m not sure if it’s because I should have baked them a little longer, because of the marshmallow cream instead of marshmallows that had to melt, or if I should have used parchment paper. I can’t get cooking spray right now, so had to oil the pan, and may have done better using paper instead. I experimented and made them for guests because I’m crazy like that, but it was worth the try. They raved about them. Oh, and I used about half of a 7 oz. jar of marshmallow cream. If I had marshmallows I think that would def be the way to go, but this worked for me in a pinch. Thanks for a great recipe. Oh, and the name makes for great conversation. I disagree about the way they look. When I pulled them out of the oven, they looked beautiful. I also recommend serving them with coffee because they are really sweet. My grandmother was a member of and past president of a group of women in Akron, Ohio, in the 60’s & 70’s called MUD HENS. These women, the hens, were ceramic hobbyists hence the mud. Just thought you’d like that story too. I’m originally from FL and my Mother’s best friend made Mud Hens waay back when; it was a special treat to get some of these. However, this is a first, seeing your recipe w/chocolate chips and marshmallows; never heard of Mud Hens with these 2 ingredients. May have to try it. The look good. Oops, sorry about the typo…..May have to try it. They look good! I would much rather be a Heather than a Jan!! I live in Toledo, Ohio. Our baseball team is the Toledo, Mudhens! Our mascots are Muddy and Mudonna, large yellow birds! I wish they served something like these bars in our stadium! These look delicious, can’t wait to try them! If shortening is not available where I am, what would you suggest using instead? More butter? Yes, I would sub in butter! I, too, hate birds . . . Or I should say ‘am scared of birds’. I made a pan of these for my daughter’s dance team, and one for the office – they are irresistible! The meringue was gooey the first day, crunchy the next. Both were great. Not only do you have THEEEE most delicious sounding things posted, you are hysterically funny! I keep reading through just to read your commentary! It is late where I am right now, I am home all alone, and it is good thing, because I am lughing maniacally, my family would think I am crazy!! My mother’s been baking these since I was a kid (many decades ago!). Here they’re called Halfway Bars. In place of the marshmallows we had a cup of chopped walnuts mixed with the chocolate chips, and the brown sugar meringue really gives it THE taste. I’m going to add some marshmallows the next time I make them–sounds exquisite! These look amazing! I attempted to make these tonight…but I didn’t look at the recipe clise enough. I used 1 whole egg and 2 egg whites in the batter & then I only had 1 egg left for the topping:( still looks great, I hope it they turn out! I’ve been making these, except without the marshmallows- and in our house they’re known as “yum yum squares” I was always a bit suspicious of the name. haha. I’m guessing mud hen bars are the original name. They are yum yum though! Toledo, Ohio’s baseball team is named the Mudhens. Seems like an appropriate snack for a trip to the ballpark. My mom made a similar recipe called “Seafoam Squares”. The Mud Hens are the minor league baseball team out of Toledo, OH. Chickens are the most gentle creatures. Trying this recipe for Memorial Day and sharing with Friends and Family who raise chickens. I live in Toledo OH the name of our minor league baseball team is called The MUD HENS!! When I first saw the name of the recipe I thought it was named for our famous team!! Just a little back story from me now I’m going to go make them!! YUM!! This looks soooooo good! Yum! These are my new favorite! Easy to make and they were delicious! I used parchment on the bottom. I’ve never understood why these are called Mud Hens. We have a family recipe that is very similar but with a much better name. No marshmallows, mix of white and brown sugar in the cookie crust and mix the chocolate chips into the brown sugar meringue. We call them Sea Foam Chews. It was my Nana’s recipe. She would have been 124 this month, so its a pretty old, tried and true stand by in our family. Love that name so much better!! minor league baseball team of the Detroit Tigers, are the MUD HENS. I’ll have to try these and take them to a game!! My kiddoes call them “mudslides” because the didn’t like the “mud hen” name. 🙂 They are delicious. I found them on your website a couple of years back. Thank you! These were a hit! I followed the recipe exactly. Will definitely make again. These are amazing. Loved the crunch on top and chew underneath. I added white chips and MnMs to the cookie base since I had some to use up. Highly recommend! These are fabulous. Speaking of gross names for food, I make a cookie and we always called the “Cow Patties” when we were kids, the name has stuck through the the years. A friend gave me this delicious recipe a good 40 years ago and yes it was called MudHen Bars even then. You cannot go wrong with these bars. Have made them many times and enjoy seeing this recipe again. Thank You!! My son has a dairy allergy…do you think it would work to use coconut oil in place of the butter? These look amazing! typically you can sub coconut oil for butter at a 1:1 ratio. Just make sure the coconut oil is in its solid state when you measure it! Made these – SO GOOD. I undercooked them a bit at first, but put them back in the oven and they are amazing. These look amazing!! I only have dark brown sugar on hand…do you think it would still work? I am going to make these for church. Would like to make them 2-3 days ahead of time. Will they be as good or should I wait until the day before? As I looked at the description for making these bars I noticed a descrepency in how to make the Meringue. It says to add 1 brown sugar to the beaten egg whites. Is that supposed to be 1 cup of Brown sugar? Sorry if there was already a correction made. I’m anxious to try these for our church pitluck this Sunday so I hope U see this soon. Thank U.